Well, today is Bastille Day, or at least its anniversary. And all of the papers seemed to think that it was going to be celebrated today in my neighborhood. Well, all of the papers got it wrong. The streets were crowded, but with cars, not pentague courts. There were signs saying that the streets would be closed on Sunday though, and there was a sign inside Bar Tabac saying that the pentaque tournament would be Sunday as well. Oh well, what can you do. I live close-by so I will head back. Luckily, I stopped into Brazen Head on my way to the street fair so my disappointment was mitigated a bit by a few beers under my belt. It was a bit of luck that got me to pop in here today. The bartender, Vicki, doesn't usually work on Saturday so meeting her was a stroke of good fortune. She was most entertaining and we had a lovely chat as I sampled some beers. 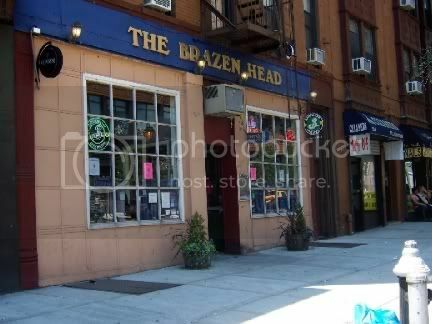 Brazen Head usually have a couple of cask conditioned ales on hand and I always like to try them. You may remember my write-up on one of their recent Cask Ale Festivals. They usually have three or four of them every year. The beer Vicki was pulling was a Cricket Hill Belgian Summer Ale. Well, that is what the sign on the cask said. It is actually Cricket Hill Jersey Summer Belgian Ale. But why quibble. Cricket Hill is, as you might imagine, located in New Jersey. Fairfield, to be precise. I had never heard of it until today though. The Jersey Summer Belgian Ale is quite nice. Not as heavy as a lot of cask conditioned ales, but a lot heavier than most summer ales. It didn't have much of a head and reminded me a bit of some of my attempts to make a home brew. It had a nice malty taste to it, but not over-powering. It was nicely drinkable and at 5.5% alcohol isn't exactly a session beer, but won't put you on your back either. They also had a cask conditioned ale labeled Butternut Stout. I am not sure who makes this or if it was properly labeled. I just has a small taste of this and I didn't particularly care for it. It tasted a bit sour to me although Vicki said the cask had just been tapped. Well, some people like a bit of sourness to their beer. 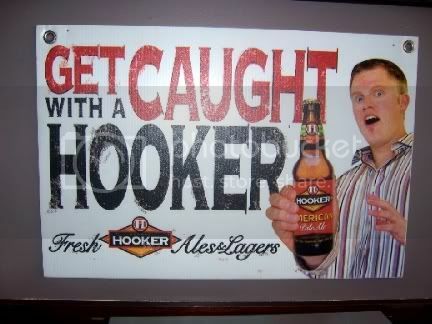 I don't mind it in some Belgian ales, but it just didn't seem to go with this one. I also had a Red Seal Pale Ale that I found to be quite pleasant. Red Seal is brewed by the North Coast Brewing Company located in Fort Bragg, California. This was a good quaffing beer, no overpowering flavors to it, but quite pleasant. Another 5.5% beer so you do get a bit of bang for your buck. 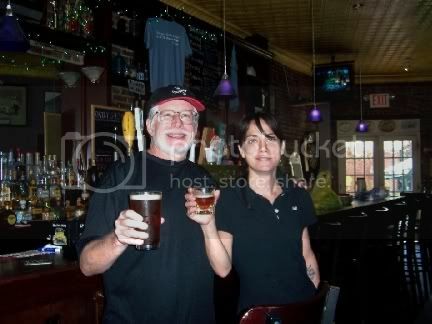 Vicki said her favorite beer on tap was the Chelsea Irish Rye Stout. She gave me a taste and it was so good that I ordered up a whole pint. This is brewed by the Chelsea Brewing Company located right in downtown Manhattan. This brewery, much like Brooklyn Brewery, turns out a lot of good beers and seldom turns out a clunker. I like to visit their pub and restaurant located right nest to the brewery too. It is right on the Hudson River and you can easily forget you are in one of the busiest cities in the world. But, I digress. The Irish Rye Stout was fantastic. Light for a stout but with dynamite flavor. It poured dark and had a nice light toffee colored head to it. You definitely got hints of coffee flavor too, as well as chocolate. You also get a hint of a kind of spice and rye at the back of the throat, kind of like an afterthought. At a hefty 7.5% this goes down way too easily. Vicki said that although she really liked it she could probably only drink one. Bar Man is not so sure about himself. It is a dry stout so it doesn't have that cloying sweetness common to most. I could easily sit on the deck, if I had a deck, grilling hamburgers or something and drinking this all afternoon. This sign caught my eye on the way out. I am not sure if those who are in Jeanne Palfrey's little black book would agree though. Well, you can probably understand why I wasn't all bent out of shape by there not being a Bastille Day Street Fair today. Now I have something to look forward to tomorrow. I had planned to grab a bite to eat though, so I headed to the Waterfront Ale House where I had a nice crispy red snapper salad and a bottle of Brooklyn Brewery's Local 1. I have written about this beer before, but let me say again, it is a great Belgian style ale brewed right in the heart of Brooklyn. Tomorrow I shall try to Bastille Day Street Fair again so stay tuned. No stopping off on the way either. Maybe I will cash in one of my free drink chips at Angry Wade's and then stop into Bar Tabac for mussels. Yesterday Bar Tabac was packed though, so I suppose it will be even more crowded today. New York City is a study in contradictions. People can adopt a veneer of sophistication that allows them to studiously ignore a celebrity eating dinner at the next table, but bring the Brooklyn Queens Expressway to a halt as everyone slows down to watch someone changing a tire. Not too many places have a parade, albeit a very small parade, to celebrate the announcement that a grocery store will be opening sometime next year. Even if that store is a Trader Joe's. 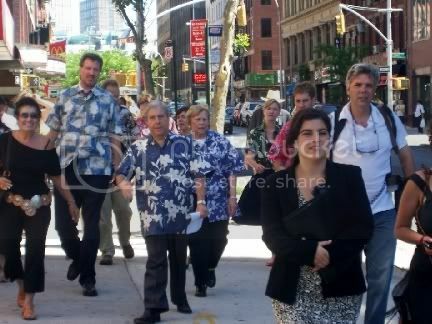 But in Brooklyn we have a Borough President, Marty Markowitz, who will celebrate everything. Bless his soul, he is Brooklyn's biggest cheerleader and almost everyone loves him. 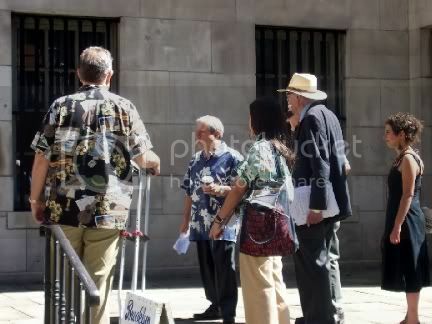 Things kicked off with a small gathering at the door to Marty's office not far from where I live. 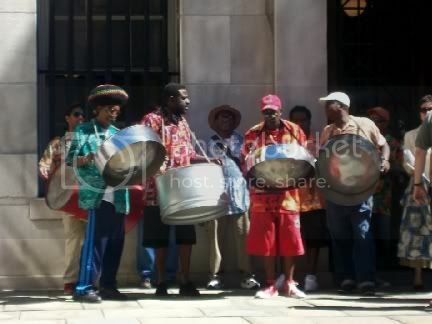 A small steel drum band added to the festivities. After a couple words to the admittedly meager crowd, the procession headed toward the site of the new Trader Joe's. The destination was a lovely bank building that will soon house the new grocery store. 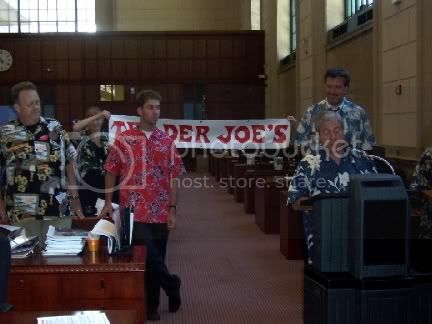 The bank is moving kitty corner to new facilities so Trader Joe's will have a landmarked building as their new home. I felt a bit sorry for this gentleman who was probably watching the end of his business at this location marching down upon him. I have the vague feeling that Trader Joe's will not be as lenient as the bank has been in allowing a fruit vendor outside their doors. Inside there were more speeches by Marty, various Trader Joe's executives, and a few local politicians. Personally, I think a Trader Joe's will be a welcome addition. 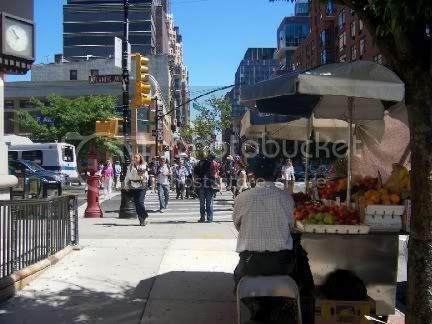 We have a lot of specialty stores in the neighborhood, especially of the Middle Eastern and Hispanic variety as well as a couple of excellent butcher shops and a very good fish monger. I doubt if Trader Joe's will steal much of their business, but the people who come to Trader Joe's may very well decide to stop in these other stores to see what they have to offer. One lady, who was in the bank on business, felt otherwise and started to loudly complain about how the smaller stores would be put out of business. She was gently, but firmly, escorted out of the bank. The liquor stores won't have to worry though. Although Trader Joe's is famous for selling low priced but decent wines, New York law does not allow the sale of wine in anything other than a liquor store. The Trader Joe's in Manhattan does have a liquor store, but it is in a separate building not quite next door to the grocery store. I have been told by my source in the liquor industry that New York law would make it impossible for Trader Joe's to open a second liquor store anywhere in the city so I don't think that alternative will be available here in Brooklyn. Saturday I plan on attending a bigger celebration for Bastille Day. 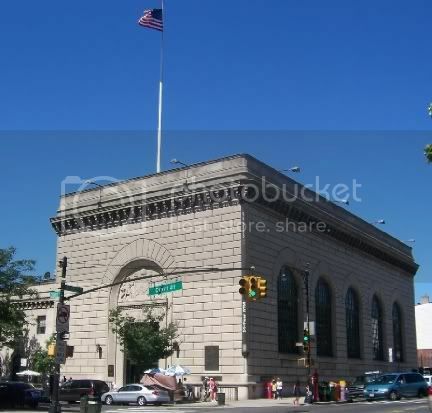 I originally forgot to mention that the Bastille Day celebration I will be attending is the one on Smith Street, just north of Atlantic Avenue, here in beautiful Brooklyn. Any subway that will take you to Borough Hall, Court Street, or Atlantic Avenue will get you there. Even the mysterious G train will get you close. I have been here before and it remains my favorite, in the theater district, place to have a cocktail and a meal. It is a wee bit off the beaten path and right across the street from The House Of Brews, a more than decent place to pop into for a beer. Tout Va Bien translates to "All Is Well," and once you enter and order up your first cocktail, a Bombay Martini, in my case, all is indeed well. Interestingly, Tout Va Bien is also the name of a 1972 film directed by Jean-Luc Godard and Jean-Pierre Gorin that starred Jane Fonda and Yves Montand. It was about a sausage factory. Be that as it may, this Tout Va Bien has been around for over fifty years and is, essentially, a family operation. 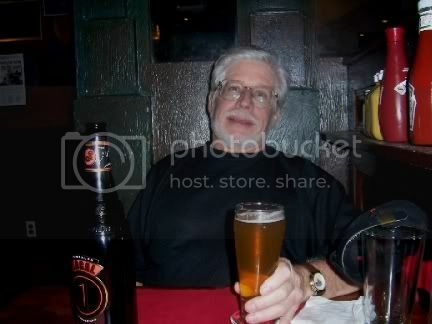 Everyone is very friendly, from the bartender to the waiter. The atmosphere is decidedly casual which makes it a fun place for either an intimate dinner for two or a larger gathering. The food is quite good. Although I usually have the hanger steak, this time I decided to try the tripe. It was delicious, and not a dish you see on too many menus. Next time I go back I will have it again, by golly. The Mysterious Chinese Woman's family likes going here as well and on this occasion we had most of them. Not one was disappointed and The Mysterious Chinese Woman's mother has now added Coq au Vin to her list of favorite dishes. Everyone seems to like the desserts too. I broke with tradition, tradition being an after dinner drink, and had a creme brulee. The crust wasn't as crunchy as I like, but it was very good. 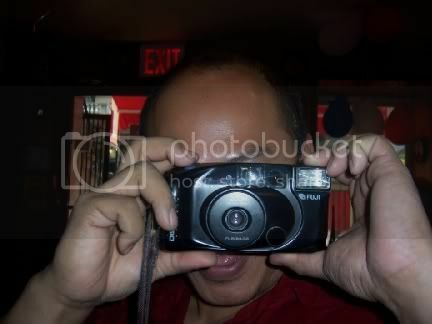 I think my brother-in-law Jim is practicing to be a paparazzi. 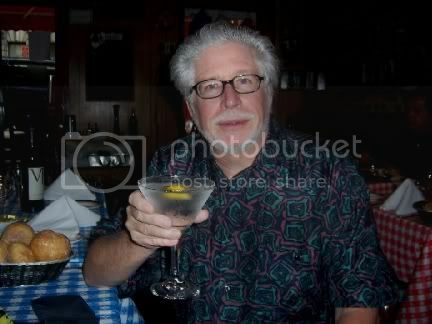 As a side note, they make very good Manhattans too. They didn't have Maker's Mark, my usual, so they used Jim Beam instead. Not bad at all and I will try them again. The Mysterious Chinese Woman was undecided about what she wanted so the bartender whipped her up a concoction of his own, something similar to a Cosmopolitan but different enough to notice. It met with her approval. There is also a small outdoor seating area if you are so inclined and the weather is nice. I might sit out there and have a glass of wine or two, but I prefer the inside for serious eating and drinking. 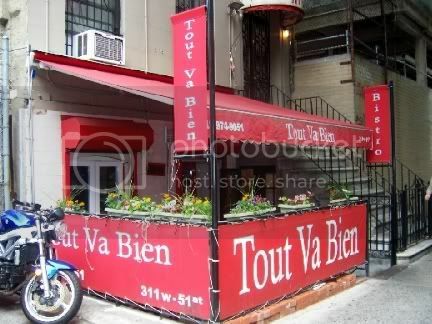 Tout Va Bien is located on 51st Street between 8th and 9th Avenues (closer to 8th), about a block west of Broadway. This makes it convenient for those going to a play, but remote enough to avoid the huge crowds, mediocre food, and high prices that you can find if you aren't careful.